In the summertime, I like a bowl of spaghetti with clams for dinner. 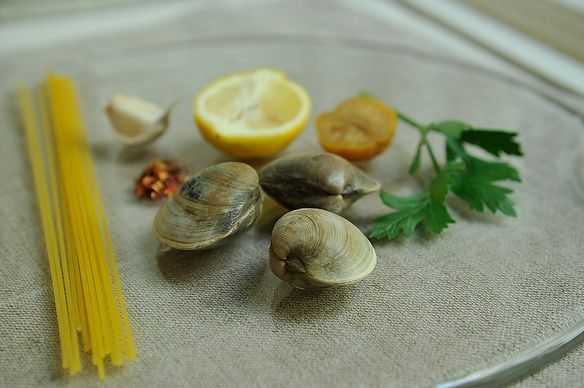 And I like the clams to bathe in a sauce of olive oil, parsley, enough garlic and red pepper flakes to get your attention, and a dousing of lemon juice so the flavors feel crisp. But it's sometimes difficult to get enough lemon flavor without watering down the sauce. I solved this problem by adding slivers of preserved lemon, which grant the sauce the powerful fragrance of lemons, but barely a drop of juice -- think of it as lemon squared. 1. Fill a large pot with water, salt it like mad, and place it over high heat to bring to a boil while you prepare the clams. 2. Pour the oil into a deep, large saucepan. Place over medium heat. When the oil begins to shimmer, add the garlic and shallots and cook until softened, about 3 minutes. Add the red pepper flakes (if you’re sensitive to heat, start with 1/8 teaspoon). Add the clams, cover the pot and raise the heat to medium high. If the pan is too dry, add a splash of wine. Cook until the clams open, and remove them as they do; transfer to a plate. (At this point, you can decide whether or not to serve the pasta with the clams in their shells or removed from them.). Set the saucepan off the heat until just before serving. 3. Add the spaghetti to the boiling water and cook until al dente, about 6 minutes. 4. Drain the spaghetti and add it to the clam sauce. Set over medium heat. Toss together, adding the parsley, basil and preserved lemon. Squeeze in lemon juice to taste. (Adjust the salt if needed.) Spread the spaghetti on a large serving platter, scatter the clams on top and pour over any juices that have collected on the plate holding the clams. Serve it forth. I can't wait to try this; I love the assertive flavor profile here. Great -- thanks for letting us know! Started out to make this for dinner tonight and somehow it morphed into spaghetti with a red sauce! Made the sauce from canned tomatoes, white wine, shrimp, rockfish, basil, parsley, garlic, red pepper flakes, olive oil and preserved lemon. So, there were a few elements of the above there, but, honestly, I would have to say I completely failed in the "following a recipe" department! F for recipe following, but A+ for recipe creating. Hope you'll upload your version to the site! I make something almost identical to this myself. But I try to use the very smallest clams I can find. At the fishmarket in my soon to be former hometown I'm allowed to pick live manila clams out of the tank myself, so I seldom end up with dead ones, or ones with broken shells. Same thing with mussels. Why use imported green lip mussels when mussel farming is one of the best, most sustainable forms of aquaculture? You just attach seed to ropes and watch them grow like like a chia pet. Back to clams, I love tiny ones from Maine or from Puget Sound. Cold, cold water makes for good mollusks. As others have said, this is one of my favorite pastas. Living in the CA desert however, I don't trust the clams I see in my markets (many open shells, etc.) I was interested in the commentator who asked about shrimp. Since they cook so quickly, would one perhaps saute them with the garlic, etc., remove them, and then add to the finished dish? Since we sometimes see acceptable mussels, I would assume the original recipe would work by just substituting mussels for clams? Thanks in advance. That's exactly what I'd do with shrimp. And mussels could be done just like the clams, only they'll open more quickly. Let me know if you try either! Spaghetti alle vongole is also one of my fave summer dishes - especially made with the tiny, sweet/briny cockles they sell (inexpensively!) at my local Asian fish market. I've used fresh lemon zest to brighten it before, but never thought of using preserved - interesting idea. I feel compelled to confess: I know it's a crime punishable by law in Italy, but I really like a little good Parm Reg grated on top of this dish (but swear I refrained from asking for it when served the best version I've ever tasted in Venice.) Not enough to overwhelm the clams, just a touch. In my defense I cite Lidia's classic Clams Oreganata - which I also often make - which includes Parm...and has a very similar flavor profile/ingredients. So, that's my story and I'm sticking to it. Anyway - look forward to trying your version soon! No crime in my book -- enjoy! Great -- hope you like it. I won't be waiting outside Celeste for a table anytime soon! Same as MrsWheelbarrow I've never thought of making spaghetti alle vongole at home... maybe because I'm a girl from New Mexico where shellfish is only eaten at Red Lobster (hehe). I'm on the East Coast now, time to cook my first batch of clams, don't ya think? Yes, do try cooking clams -- I think you'll be delighted by how easy they are to deal with. One tip: use a vegetable brush to clean the shells (they can be muddy). Perfect way to use preserved lemons. Thank you for this great recipe. For some unknown reason, I've never thought to make this at home. Now, I certainly will. Yes, and you can use more or less than I call for. I kept it fairly conservative. Good for hot weather, with a crisp white. LOVE THIS - and I have my last jar of preserved lemons (homemade) staring at me ... perfect!!! I love spaghetti alle vongole. I haven't had it before with basil, and the idea of incorporating preserved lemon is brilliant. I look forward to making this! Great recipe! We don't eat clams (allergies), but this would work great for shrimp, don't you think? absolutely -- and fish, too!